July 7th was this blog's 5th anniversary. I think that's officially longer than most marriages last, right? Or at least longer than I thought mine would last. Kidding, of course. Five years ago, my friend Marie encouraged me to start my own blog. She had just started hers , and after reading it for awhile, writing my own began to seem like a good idea, especially considering that I was a writer in both my personal and professional life. It's natural to post my innermost thoughts on the web rather than keep them squirrelled away in a journal that no one but me reads, right? Amazingly, there are a handful of you who have been reading this blog since it's beginning (or near its beginning): Christine, Judy, Ramona, Pru, and I'm sure a few others who I am embarrassingly forgetting to mention. I will always be grateful for your friendship and support, especially considering Interrupted Wanderlust has changed radically from the days where I blogged about running and baking bread and lusting for babies. I know I'm not as interesting to read anymore. I am working hard to correct this, but, most days, the hours literally evaporate. This blog has taken a back seat, and this does not make me happy. To the rest of you who have picked up this blog somewhere over the last several years and read regularly, and to those who may stop by occasionally to see what I'm currently bitching about, I want to thank you as well. I know what busy lives you lead. The fact that you take five or ten minutes out of your day to spend them here, reading my drivel, and sometimes taking the time to comment is no small thing to me. Every blogger loves comments. For me, the comments are a support system and an advice stream (far different than the steady assvice stream that I get from my family) that I could never duplicate in my "real" life. Thank you for empathizing and giving it to me straight, even when you disagree with what I've written. At this point, I don't know where this blog is heading. I have no fewer than 20 posts saved in my Drafts folder, waiting to be written. I am pressed for time on an hourly basis, seven days a week, and between my work, my training, my kids, and ignoring the 17 inches of dust coating every inch of my furniture, I am beyond busy. But for now, I'm going to keep writing when I can. I want to and I need to. Another month down in twin toddlerland. Luci and Nicholas have spent the last four weeks perfecting the use of the words "Mine!" and "No!". We have hourly Pay-Per-View-worthy fights over plastic baby spoons, knock-off Matchbox cars found at the bottom of Cheerios boxes, and occasionally, the odd clump of cat hair. You name it, these two will fight eachother to the death for it. Luci has made great verbal gains in the past month. She's now rocking the two-and-three word phrases her brother has been using for the past several months. Her favorites include, "Mommy? Are you?" (Where are you? ), and "Here you go, Mommy!" (while handing me whatever treasure she happens to have in her hands. Much like her big-sister, Luci loves to color. Also like her big sister, she seems to be left-handed, although I think it may be a few years yet before we can definitively say this. She will not tolerate anything in her hair for long, a stage I remember loathing in Isabella, as both my daughters have thin, wispy hair in desperate need of a barrette to keep it out of their faces. I believe this hairband lasted 30 seconds in her hair before she yanked it out. My tiniest terror still has a Sybil-like personality, and can turn on a dime from sweet, playful toddler into screeching, apoplectic harpie. I am convinced that someday she will win an award for her performances. I have my hopes set on pocketing the boatload of cash she will undoubtedly rake in for her film-worthy dramatics. And yes, I feel I am owed every dime she will make. Her two top teeth are finally coming in. Once they are fully in (and they just broke the gum line about a week ago), this will bring her total number of teeth to four. I am convinced this has to be some sort of record. Nicholas has finally learned to kiss correctly, after months of simply pressing two pursed lips to cheek in an imitation kiss. With this new-found skill, he is our kissing bandit of the month, surpassing Luci who has held this title for quite some time. Of course, his kiss approaches cannot be trusted, as any minute he may choose to curl back his lips and sink his razor-sharp teeth into your skin instead. Dude likes to bite. Mommy is decidedly not a fan. I'm convinced this is what Tony Soprano looked like as a toddler. He knows when to turn on the charm, though, as Nicholas fancies himself the mayor of my health club's daycare, or so I'm told. He greets all the kids when they arrive with individual shouts of "Hi!" and as soon as he sees his favorite staff member, he shouts her name as if he hasn't seen her in a year: "Keyeeeee!" (Kelly). Nicholas can count to 10, and knows a lot of his letters if you sing the "Alphabet Song." For example, if I say, "A, B, C, D..." he'll say "E!". He goes down for his naps and at bedtime so incredibly easily. I will rock him for mere minutes in the chair in his room. Then he lifts his head, points to his crib, and says, "Crib!" I put him in there, and that's it. The entire process takes less than 5 minutes. Both babies like books, although Nicholas is heavily into the book-ripping stage. His current favorites are Isabella's collection of Clifford tales. The jury is still out on whether he'll inherit her Bleakman love. This pair is still very, very high-needs. My house is still in chaos mode, and we're still a traveling circus everywhere we go. But they're almost two. Which means in another year or so, I know things will be better. And if I've lasted this long, what's another 18 months, right? Likes: Crawling on all fours and meowing like a cat, bringing me my shoes, whether I need them or not. Isabella's (and now the twins') table set used to belong to my sister and me when we were kids, which means it's officially older than dirt. One of the chairs broke last year when my grandma decided to sit on it. It's been glued back together, but I'm nervous every time one of the kids is on it. Plus, the set only has two chairs, and last time I counted, I have more than two children. 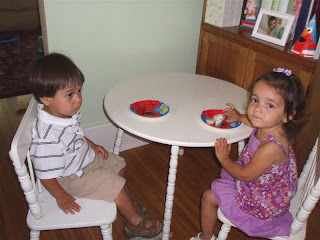 While they're not avid artists yet, in a few month's time this table will have as much draw for the twins as it does for Isabella, and frankly, I could do without the screaming sessions that will result from a bloody fight over which two kids get to use the chairs. A new table and chairs set is desperately needed. I've recently been selected as a CSN Stores Preferred Blogger, which means that every couple of months, I can review a new product for them. CSN Stores sell a huge variety of products, including dining room furniture, baby gear, and Isabella's fab new bike, which I reviewed in May, and which Melissa ended up buying for her daughter's 5th birthday. The prices are great, and many products come with free shipping. I'm going to review a new table and chair set for CSN Stores. Stay tuned for the review! There's a lot of running-group love in Spirit of the Marathon (which I can't recommend enough to my fellow runners). All of the people in the movie are training for the Chicago Marathon. Most are ordinary people, some training for a first marathon, and almost all of them train weekly with the same large running group made up of different pace groups. In one particular scene, one of the featured women is hugging her fellow group members. She had recently gone through a divorce, and her weekly running partners were her support system. They talked about their weeks, psyched eachother up for the long run ahead, and once it started, they chatted their way through mile after mile. When this particular woman started to lose it both physically and mentally around mile 20 of the Chicago Marathon, it was one of her running partners who literally scraped her up off the ground to help her beat the mental demons and finish. This is not my training experience. Since I started running seven years ago, I have almost always ran alone. Occasionally, I would run with my sister when she was in town. But other than an early training run back in May in which I ran with my sister and uncle, I have trained alone. There aren't many people in my "real life" who know about my half-marathon training, and even fewer who care about how important it is to me. My main support comes from my friends in the computer, especially my Marathon Godmother, people at my health club, and some preschool friends who are also runners. My extended family sees my training as foolish, as "just another thing" in a life that was already stressful and full of responsibility before I set this goal. The hubs is often resentful of the time I spend running, as this means increased responsibility for him at home. My main support, honestly, comes from Isabella, who always asks me "how many miles did you run today, mommy?" when I get home from early-morning runs, or who gingerly rubs a Neosporin equivalent onto the many blisters on my feet. It is hard to train without a support system. But it's also given me the mental fortitude to realize that while the half-marathon is a race in which I'm (obviously) competing against other people, really, I'm competing only with myself. It's me and 13.1 miles on race day, and running solo all these months has prepared me to do battle with the half on my own, and in the end (hopefully) meet my goal of a sub-two-hour race. This isn't to say that running groups don't have their benefits. I tried one out on Saturday for the first time. I joined our local Fleet Feet distance runners for a 9-mile run. My long runs to this point were averaging less than an 8:30 per mile pace. A week ago, I ran 8.1 miles at an 8:16 pace. However, as I learned on Saturday's 80-degree, sunny, and humid morning, there was a very good reason why there was no 8:30 pace group (the group I intended to join), and that the fastest pace group was a 9:30. Running long and running very fast are not advisable unless you happen to be Deena Kastor. If race-day weather conditions mimic Saturday's (and in upstate NY in September, they very well could), then there is absolutely no way I can sustain an 8:30 pace. I finished a few minutes behind the group in 1 hour, 25 minutes. Frankly, I'm worried about sustaining a 9:00 minute mile pace, which will get me to the finish line in just under 2 hours. Running with the group in those conditions on Saturday taught me an important lesson, and as a result, I am purposefully slowing down my runs until race day to focus on endurance. It was also great to be among a large group of runners in a non-race environment. Talking about running isn't something I get to do a lot of "in real life" and I enjoyed the pre-run and post-run chatter. I liked the encouragement I received from the guys once I finished my 9-miles. It's support I don't have when I run solo. But I couldn't get into my head while with the running group, as I'm used to doing during my runs. I always, always run with my iPod. None of men I ran with (and the group members were all men in their 30s and 40s in perfect physical condition) did. They chatted with eachother. They tried to talk to me, asking me to sing what I was listening to, asking me how I felt, etc. And I did not want to talk to them, and towards the end of the run, I literally could not talk to them because I was struggling to breathe in the heat. I was constantly worried whether the older dude with the crazy stride and weird arm motions was going to whack my arms as he ran alongside me. I was concerned I was going to miss a turn on the route and run smack into one of the guys because I couldn't hear the pace group leader. And of course, when I fell a bit behind, I felt like a gigantic loser because I was suddenly the girl trying to run with the big boys and clearly out of her league. So on Saturday, when I'm scheduled to complete the first 10-mile run of my life, I will be running solo. And while keeping my pace steady and slow(er) on my own may be challenging, and while the camaraderie of being amongst fellow runners will be missed to a certain degree, I've realized that I am my own best running company. Thank you to everyone who entered the NOVICA $50 gift card giveaway. Jeni, I can't seem to find your email address on your blog, so please send me a message so I can give you your gift code. 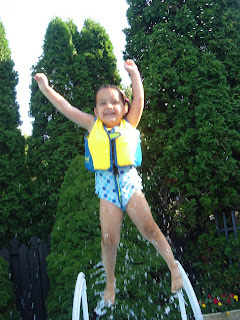 Isabella recently wrapped up two weeks of swimming lessons. If you're interested in what lessons are like for preschoolers (Hint: They will not be able to swim the length of an Olympic-sized pool under water in less than 30 seconds at the end of the lessons), you can check out my review here. To our backyard baby pool, we've been in the water a lot this summer. Thank God for free entertainment! 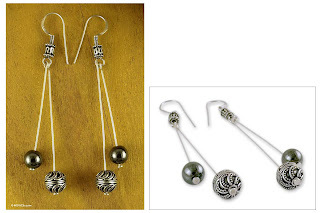 Two more days to enter my $50 gift card giveaway from NOVICA. One of you will win on Friday! It wouldn't be summer on this blog without this photo sequence. 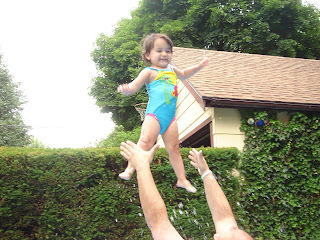 Behold, the hubs launching our preshuss firstborn into the air for the last three summers. A lot of the time, I think that time is literally crawling by. I have been changing diapers non-stop for the last four years. But then I look at these photos, and no, time is not crawling. It is speeding by. And I have to learn to appreciate the now before it's gone. 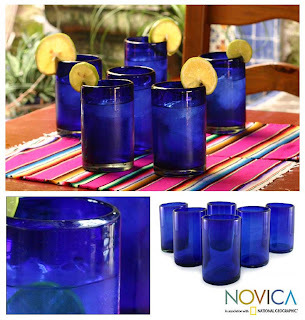 Don't forget to enter my giveaway for a $50 gift card to NOVICA. I will pick a winner on Friday. I am super-excited about my latest giveaway. 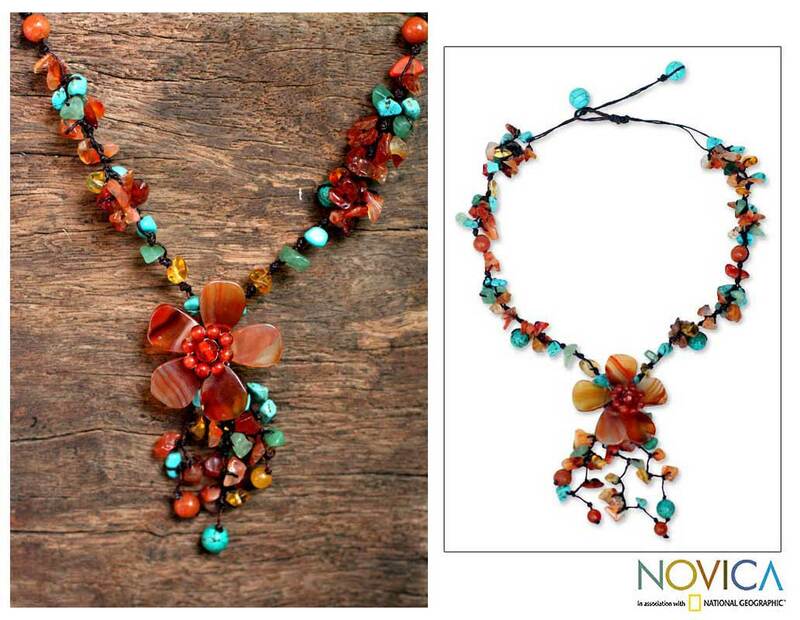 I was recently contacted by NOVICA. They are one of the leading fair trade artisan websites, and they work with National Geographic to offer talented artisans around the world a place to express their artistic talents online and to give them access to the world market. NOVICA works with 2,000 international master artists, and the website offers over 30,000 works of art, each of which is handcrafted. When you order from NOVICA, you support the work of artists from Peru to West Africa and from Thailand to Mexico, and everywhere in between. And what's really cool is that with each order, you receive a card from the artisan, which will tell you his or her individual story. Running your own business is hard (trust me, I know), so NOVICA has even created a unique microfinance program to help the artisans expand their craft through small loans, for which they are charged no interest, which I think is just incredible. If you're so inclined, you can even lend a small amount of your own to a struggling artisan. Their online catalog is huge, and the jewelry and home decor sections are particularly extensive. 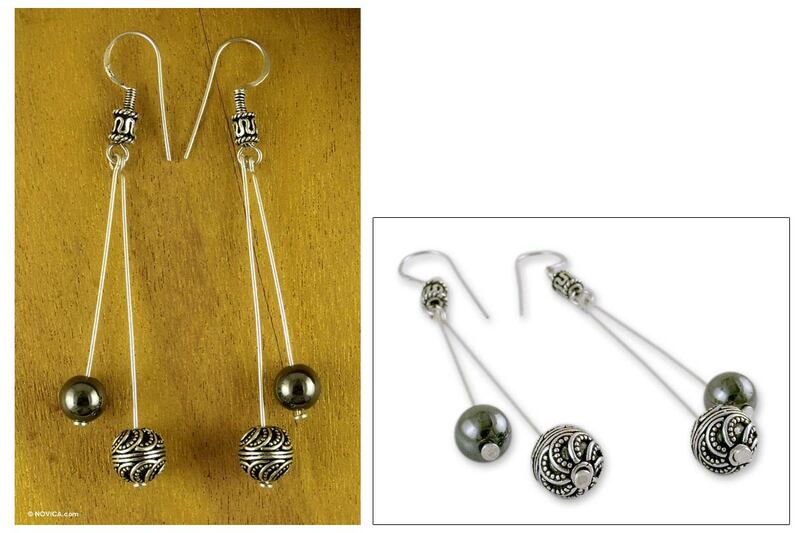 NOVICA has generously given me two $50 gift cards, one for me and another for one of you to spend on their site. 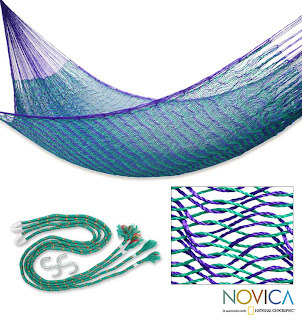 Perhaps a hammock for swinging on cool summer nights? This one is $45.99, and only $2.99 for shipping! And these necklaces are so pretty. The twins would make sure these wouldn't survive a day in my earlobes, but they're gorgeous for a night out. You will receive one entry for each of these. Also, please leave me a way to get in contact with you if I cannot do so via your blog. 1. Follow or subscribe to Interrupted Wanderlust (or tell me you already have). 2. Follow or subscribe to my health and wellness blog (or tell me you already have). 3. Post about this giveaway on your blog, and link back to this post. 4. Visit NOVICA and leave a comment here about what you would buy if you won. I will use random.org to select a winner on Friday, July 16th. There's a new post up on my health and wellness blog about marriage weight gain. Did you pack on the pounds after moving in with or marrying your significant other? I did, and apparently, I am not alone. Check it out! I took dance lessons for three years, from age 4 to age 7. I was not a particularly talented dancer, which comes as no surprise now given that I am a spectacularly uncoordinated adult. The only reason I succeeded in blending into the crowd at the goth dance clubs I used to frequent in college was because I mastered what the hubs likes to call my "box step." Basically, I moved my feet in a square pattern over and over, while hoping desperately that everyone else was too caught up in their own angst to notice my pathetic attempts at rhythm. 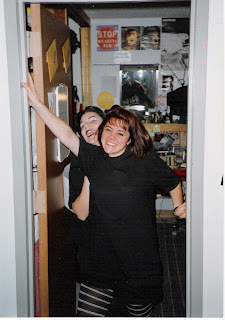 This is me as a freshman in college on the way to the local goth club at which I tended to spend a lot of time. And yes, I realize that a true goth would never be caught dead (ha) grinning from ear to ear like this. Apparently, dancing has changed quite a bit since the early 80s, when my routines consisted of moving awkwardly to "Keep Your Sunny Side Up" and "One-Eyed, One-Horned, Flying Purple People-Eater." You've probably seen this video already. It went viral a few weeks ago. But because I'm behind on blogging, I'm writing about it after the buzz has died down. Click the Pause button and let the video load for about 30 seconds, or it will end up starting and stopping often. Very few things leave me speechless. This? Rendered me completely silent the first time I saw it. I was, without a doubt, horrified. I've read various comments on this video on several different websites. There is a large faction of people who have accused those with reactions like mine of seeing something (meaning, something sexually exploitative) that is simply not there. Of refusing to appreciate this video for what it is: a clip that showcases the dancing talent of these seven-and-eight-year-olds. But I cannot look at this video without physically cringing. There is something deeply disturbing about watching little girls perform bumping and grinding dance moves better suited to Striptease than to the 3rd graders doing them. An adult choreographed this routine. More adults sat in the audience and went wild while these girls danced. Another adult designed costumes better suited for hookers or strippers in sizes to fit little girls. And yet another grown-up put this video on a website not with a title warning viewers that what they were about to see was wrong on so many different levels, but instead with this: "Little girls working it to 'Single Ladies' and they are Killin' It!" Walk into any clothing store and you'll see clothes for Kindergartners that look like those an 18-year-old would wear. Walk into any spa, and you'll see services marketed to this same age group and younger. So really, this routine for a dance competition shouldn't have surprised me as much as it did. But as the mother to two daughters, I cannot help but feel depressed and powerless to do anything to shelter them from the world they're going to enter into in just a few short years. My first but no longer my tiniest dictator had an overall decent month, but we've been witnessing some defiant and sassy behavior of which I am not fond. Listening has become an issue, and as a result of not doing it, Miss Isabella has been logging some minutes in Time Out, during which she screams and yells like a caged wild animal. "Hey, mommy! Come look at this!" "Mommy, will you play preschool/library/puzzles/coloring/painting/Play-doh with me?" "I need you to be done with your work now." As you might imagine, this is killing my work schedule, so for this reason, and several others I am looking into getting a part-time nanny/babysitter for a few mornings and/or afternoons a week. Trying to do the volume of work I now have without childcare has moved into the sphere of ridiculous, and my teeny, tiny shred of sanity is just about severed. The problem I'm finding, however, is that of the three leads I had, two never called/emailed me back, and the third cancelled her interview with me hours before she was supposed to arrive because she had just received a job offer that would conflict with the hours I needed her. Apparently, nannies are not affected by the state of the economy. The car situation is becoming unmanageable. Isabella is quite literally stuck in the middle of two pincer crabs. All three are side-by-side in the back of my Trailblazer, and the twins have started attacking Isabella by pinching her. The poor thing has nowhere to go, and obviously, much screaming ensues when Luci and Nicholas are on the attack. The thing is, I do not want a minivan (no offense to my minivan-loving peeps, and I know there are many of you out there). My dream car is a Mini Cooper and I do not think a minivan could possibly be any further away from this. A new car of any kind is out of our price range right now, and I don't know how feasible it is to get a used vehicle capable of comfortably transporting five people for no more than what we're paying on the Trailblazer right now. In more positive news, Isabella had a blast in her two-week summer camp at her preschool. I wish it was held all summer long so she could enjoy spending more time with her teachers and her preschool friends, many of whom she won't see next year given that she's transitioning to the four-day-a-week afternoon program, and many of them are staying with the three-day morning program. She's taking swimming lessons at my health club now, and is enjoying them also, but my dear daughter is not a natural swimmer. I'm watching the lessons and taking photos of them for the club's Facebook page and blog, and while the other kids seem to be getting the hang of things, Isabella is not quite as adept. She has one more week to go, so we'll see if she improves. The Charlie love has intensified since his triumphant return. While she would carry him around the house about 80% of the time before his five-hour vacation in the Thomas the Train puzzle box, Charlie is almost always in her arms now. She's also taken to anthropomorphizing him ("Charlie just told me his tummy hurts. When Charlie was lost, he was scared.") She clearly has that separation very much in mind, although she hasn't told me that she's afraid of losing him again. Note to self: Buy replacement Charlie now. She still loves art and craft projects and would do them all day long if I had the time or inclination to do them with her. Her Highlights magazine had a recipe for homemade play-doh in it, so a few weeks ago, we made some. Isabella loved it. Speaking of parental authority, do you think McDonald's and "Big Food" (think Kelloggs and Kraft) are responsible for the childhood obesity epidemic because of the way they market junk food to kids, or do you think parents are to blame? I wrote about this on my health and wellness blog. Check it out and tell me what you think.